Named the 'Garden of Awakening Orchids', this walled classic garden in Portland's Chinatown is a replica of traditional gardens found in Suzhou, Portland's sister city in China. It combines the elements of water, stone, architecture, literature and plants to create balance and harmony. 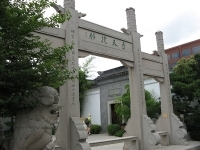 The garden is both a living museum of flora and fauna and a cultural heritage garden, containing interesting specimens like Chinese paper bush, water daphne, and Chinese plum. The classical tea house in the evocatively named Tower of Cosmic Reflections. It offers a tactile experience of the art and culture of Chinese tea. This attraction adds variety to a garden tour of Portland and generally receives rave reviews. Opening times vary according to season.